Physicists at CERN say they’ve found the Higgs Boson. Not surprising – illustrations of the “God Particle” closely resemble the FSM. Below are two good articles about the discovery. Scientists seem to keeping a lid on the FSM connection, for now. Smart. Confirmed! 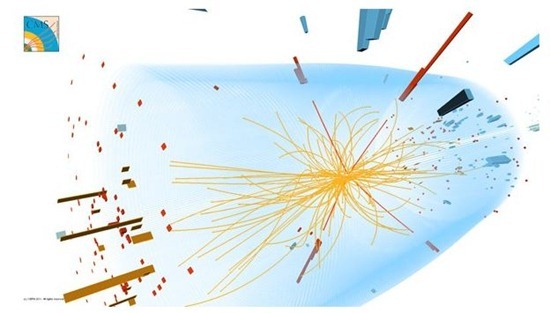 Newfound Particle Is the Higgs! Check it out for another crystal clear picture of His Holy Noodliness. I think the FSM is a fairly large monster (although he/she/it can probably alter size at will). If the FSM’s Noodley Appendages can hold worlds together the migits would be enormous in size. There are also dwarf stars and dwarf galaxies, which may make midgets/migits seem small by comparison. If they go near a black hole they may get stretched by the rapidly increasing gravity field. Yes, they will become infinitely long noodles. Did you hear about the 2 lesbians kissing in a a store in Hawaii that got arrested and spent 3 days in jail? I had to read the report three times because I thought that they got it mixed up with Rawaii which is in syria and is run by the mooslims. Just warning the LGBT to stay away from Hawaii, although it is in the US, it seems like their police dept. has been taken over by the mooslims! When the large-scale immigration of mooslims begins we must all study Shariah law or will be in danger of incarceration! There was actually a “serious” debate about 3 years ago in the Adelaide university(that’s in South Ostraya) about the introduction of sharia law. I don’t see why there should even be a debate. We have our own laws. They used to work fine until those meddling politicians and bureaucrats started writing their own versions. Did they put the CCTV film on YouTube? I want to watch it.